I think the line brush with the brown handle was from LeekeWorld, as are the blue lip detail & eyebrow brushes. The clear handled lip brush is from Thailand and the eyeshadow & cheeck blushing are make up brushes brought within Finland. White handled one is Ibero’s and blue Lumene’s. I use different gloss for resin BJDs and DDs. 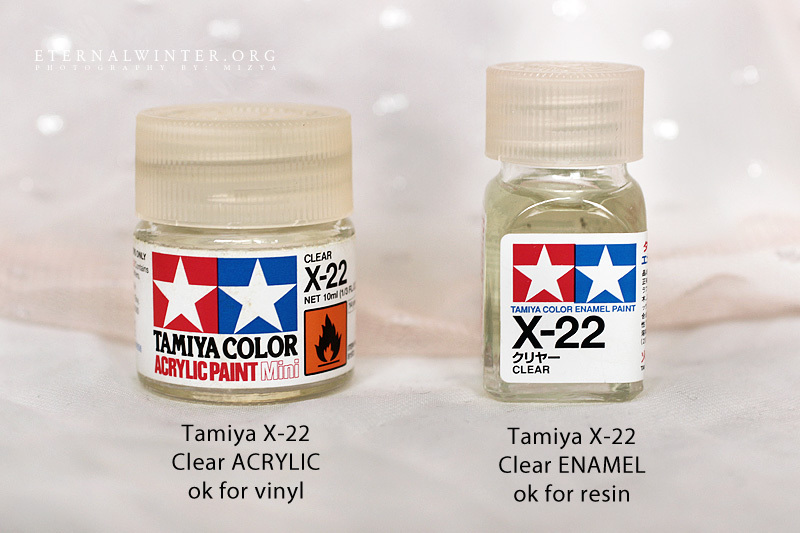 In the past I only had this Tamiya X-22 Clear enamel that I used for resin dolls with no problems… but it does not work for vinyl at all. It never dries and remains sticky and collects all the dust, ugh… not recommended. So, I bought this Tamiya X-22 Clear ACRYLIC that is water-based and works for vinyl nicely. You can use the acrylic gloss for resin, too, but I labeled them like this from a vinyl dolls customiser’s viewpoint. Also, I find that the Enamel gives a really nice glossy finish for resin dolls, while this acrylic is quite lame in comparison… but that’s my personal preference. So generally for DDs I do only 1-2 coats in between, depending on how successful I am and if I need to fix some things. For BJDs I need more ’cause they have more blushing & lines, so the coats in between are anywhere from 2 to 4. But I try to keep the coatings to minimum. Especially with tan skinned dolls, MSC UV-cut tends to lighten them, so the less coats the better. For the first layer I sketch the shape of the lashes with a light brown pastel. Oh, and note that the pastels have to be wet for you to be able to paint lines: scrape off some pastel dust on a piece of paper, dip your brush in it and dip the brush in water: make some test lines on the paper (or your hand) and take the brush to the doll’s face when you feel you’ve got enough pigment on your brush. I also usually have the eyebrow shape here, but I screwed up too many times so I had to leave that for the next layer completely. The lines look quite ugly at this point, haha…（　´∀｀）The lighter coloured pastels are hard to spread smoothly. I also blush the cheeks and lips lightly at this point. … the pastel will smooth itself out eventually, ahah. (;´∀｀) After I get the lashes darkened, I finish the eyebrows and add more blushing on the cheeks & lips and also blush the eyebrows & lashes lightly to soften the lines a bit more. So the end result ends up being something like this. I also do those blushing lines //// on the cheeks and the white dots on the same layer as the darkened lashes & blushing. Then I do the final coating with MSC. As a result, we have a cute custom dolly, yay! Megu’s face up is a bad example ’cause I screwed up her eyebrows and lips… . ( ̵˃﹏˂̵ ) Shows I still have a lot to learn. I found it helpful, thanks for sharing!! I never saw a DD paint job before, so I’m glad to see the differences with this and BJDs. Practise is the key with face ups, I’ve noticed… and also having good tools helps. I think in the beginning, in like, 2007 when I first tried doing face ups, I had these really hard pastels that barely had any pigment… my face ups were always so messy and grainy. =A=;; These Mungyo pastels are pretty good quality for their price, although some of the colours don’t seem to work as well as the others… but I definitely can get them to look much smoother than those awful pastels that I used in the beginning. :3 I think they’re a great alternative if you can’t afford to invest a lot of money in those super expensive high-end pastels. Hey! I was wondering. Do u have to use the gloss for the vinyl? And the base coat. What is that? I have a lot of questions. And what do u suggest for the make up for Juvia Lockser from Fairy Tail? Thanks for posting your progress. I am a huge admirer of people who can paint their dolls. I have only tried once or twice but I made a mess of things and decided to just send out heads for repaints to people much better than me at doing that sort of thing. I love the addition of the III and the white dots. It gives her this really cute school – girl look. Thanks for the tutorial! She’s beautiful! I had an idea of of using water with pastels but actually never tried it, glad to know it works very well. You’re welcome! :3 Pastels work pretty nicely for linework, as long as you can find ones that have enough pigment. Most face up artists either use acrylics or watercolour pencils, but I don’t really care for either of those… watercolour pencils tend to look grainy and rough and acrylics are a bit more challenging to work with – and especially if you make a lot of mistakes like me, it’s more difficult to fix those mistakes without having to scrub the whole face up off. Thank you for this. I have been searching on how to paint DD Vinyl heads, your blog is great. Did you use Tamiya clear acrylic paint for the base and the gloss? Hi! I would like to ask what method you used to remove faceup on DD Mariko? is she the White Skin variant or the Semi White one? I use acetone free nailpolish remover by Maybelline (photo) to remove face ups from both my resin and vinyl dolls. Winsor & Newton brush cleaner is not available in my country and I don’t have the patience to use rubbing alcohol, as nailpolish remover does the work much faster. It’s completely safe as long as you don’t submerge the head in it, but instead use a cotton pad to gently rub the surface with it, and then carefully remove any possible residue with dishwashing soap & lukewarm water. I’ve not had nailpolish remover damage any of my dolls in the 12+ years that I’ve been in this hobby.